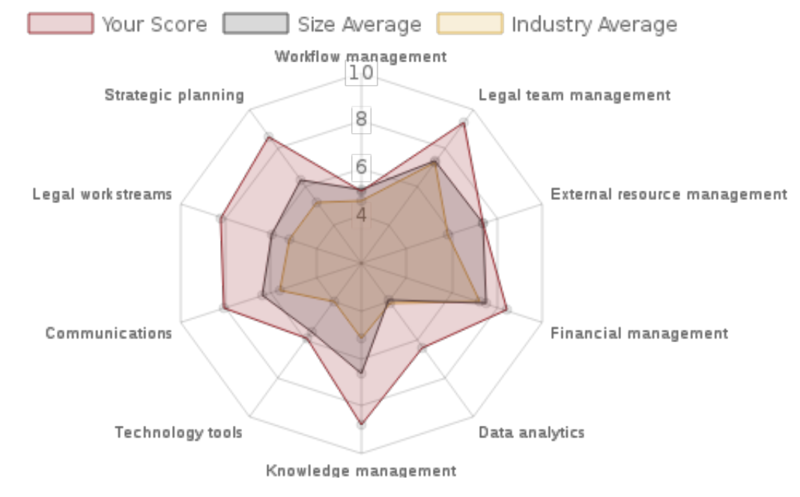 The study of legal operations is nothing if not comprehensive: The Corporate Legal Consortium charts 12 core competencies, and the Association of Corporate Counsel’s Legal Operations Maturity Model has 14 prongs, from compliance to strategic planning. As a profession, we have defined the areas where legal operations can make law departments more efficient, and they’re as daunting as they are detailed. Given that most legal teams don’t have a dedicated legal operations administrator, it’s reasonable to assume all of your peers aren’t living in a Xanadu of efficiency. How do your efforts measure up? What about companies your size – or in your industry? Xakia has launched the Legal Operations Health Check, a new tool to help in-house lawyers evaluate the health of their departments and plan operational improvements. The only tool of its kind, this legal operations checklist incorporates best practices from CLOC and the ACC, as well as our experience serving in-house lawyers on three continents. There’s no cost to participate. We won’t use or sell your personally identifiable information, but over the next few weeks we will compile benchmarks and trend reports; follow us on Twitter or LinkedIn to see this industry intelligence. And if you’re just getting started in legal operations - or you want to get started in legal operations - the Legal Operations Health Check will recommend some straightforward tactics that will help you become more effective and efficient – and make your CEO happy while you’re at it.